It shouldn’t come as a…shock…to you that behind every healthy, clean swimming pool is a top notch swimming pool service in Orlando. But why do you need a pool service? The table below shows what the average pool owner (12,000 gallons, with screened enclosure) would use to maintain their pool themselves. This example assumes that the pool is being tested weekly and the proper adjustments to the water chemistry over the period of a typical four month rotation has been made. Keep in mind that the table does not represent the cost for any loss of control of the chemistry and algae blooms, nor does it include taxes on chemicals or supplies. Improper treatment can require algae treatments that are very costly, which can double and even triple the cost listed in the table shown. A great pool care service in Orlando can save you time and money. We often hear that maintaining a pool is more expensive and time-consuming than customers had anticipated. The truth of the matter is; when your pool equipment is running properly and your pool chemicals are maintained, the overall cost of maintaining a clean pool is much lower. In fact, our customers often see a decrease in the cost of pool supplies. We know what great pool care in Orlando takes, which is why we want to lay it all out for you before you decide what you may need or what best suits your specific pool issue. Having your pool maintained by a professional pool service in Orlando is essential to keeping yours in tip top shape. 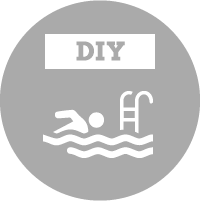 Clean, functioning reliably, and safe are the most important bullet points when considering maintenance of your swimming area. Your pool should be a beautiful, healthy and virtually stress-free addition to your home, which is why we strive to emphasize this and assist you in any way we can. Maintaining a swimming pool requires regular cleaning and balancing of chemicals. Water that is not properly balanced and maintained can be very damaging to the pool surface and equipment as well as harmful to swimmers causing itchy skin, burning eyes, and ear infections – no one wants that. 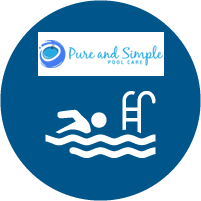 Pure and Simple Poolcare aims to offer you the peace of mind in knowing you can enjoy your pool and live your life without ever having to stress about the maintenance. Ultimately, we’re the pool service in Orlando who gives you the gift of time, saving you money and ensuring you a stress-free process with your best interests in mind.